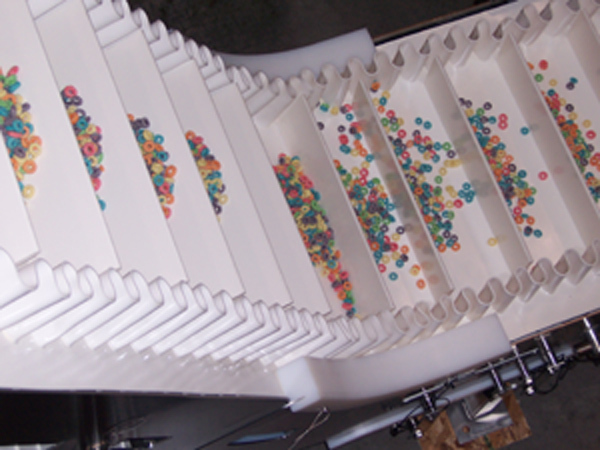 A major American cereal manufacturer needed an application to replace an existing conveyor system with a more sanitary and time efficient cleaning system. The system previously in place used buckets and chains to transfer the cereal through the plant. This system was extremely time-consuming to clean on a daily basis. However, the biggest challenge of this application was the fact that the conveyor needed to be over 20 feet tall and rise at a 45-degree angle. The cereal manufacturer needed Dorner to find another way of moving their product that was sanitation focused, but able to fit in the tight floor space available. for cleaning the belt both on the top and bottom of the belt. Both of these features increase the sanitary efficiency of the system. This increased sanitary efficiency, paired with the systems ability to be configured and run at a 45-degree angle, the cereal manufacturer was able to reduce cleaning times significantly while improving sanitation to comply with government sanitation regulations. The cereal manufacturer was able to save valuable time and money by replacing their older system with a more efficient and effective system engineered by Dorner.